Being a blogger who writes about skepticism can be frustrating. After reading yet another “Never eat <whatever>! It’s a poison! THEY don’t want you to know!” article, I had this grand plan of writing something similar, but satirical. I was going to write an article that warned about something many people love – chocolate. This was going to be similar to the hilarious “dihydrogen monoxide” hoax from a bunch of years ago. I chose chocolate because it’s something that is enjoyed by many people but few know much about what’s in it or how it’s made. 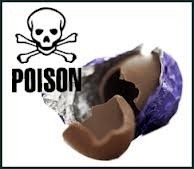 Could there be toxic chemicals used in the manufacture of chocolate? Sure, maybe, I don’t know. I was going to do some research into the chemical make-up of chocolate, the growing and manufacturing process, packaging, marketing, all that kind of stuff. Anything even remotely negative was going to be blown out of proportion. Facts would be exaggerated. I wasn’t going to add outright lies, but maybe stretch the truth a little here and there. I’d stress that chocolate contains chemicals and genetically modified foods. I’d point out alternate uses for some of the chemicals in it. The longer the chemical name, the better. I’d point out things in chocolate that were “chemically similar” to some actual toxin, as if that means anything. And I’d make sure to use the word “chemicals” a lot. Then I’d add some stories about “people I knew” or had heard of. So-and-so got really sick and stopped eating chocolate and got better. Hell, I could even use my own experience – I had some chocolate the morning of my pancreatitis attack (true) and spent the next two months in the hospital (true). But then after two months without chocolate (true), I went home and I’m totally fine today (true)! All of those things marked “true” are true, even if they’re completely unrelated. And there you have it – a compelling story that is completely true! Totally misleading, but true! The result was going to be an article that would make people think that chocolate was a horrible toxic product, child slavery was used to make it (though this may not be far from the truth, unfortunately), companies that made it were hiding the truth, and the FDA was in on the whole conspiracy. It was going to be fun! Then at the end I’d explain how I’d stretched the truth and exaggerated things and such, thus making the point that when you see articles talking about how toxic aspartame is (or high-fructose corn syrup, or genetically modified foods, or whatever) you should think twice about what you’re reading, and realize that these types of articles routinely use misleading wording to scare people. But I can’t write such an article for one simple reason: people already have, and theirs isn’t satirical. It’s full of the same half-truths and scary-sounding words and stuff that I was going to use, but these people actually believe it. Poe’s Law was originally coined to refer to Creationism, i.e. you can’t write a parody of Creationism that someone won’t mistake for the real thing. It was then modified to include any other “extreme ideology” like alternative medicines or (especially) conspiracy theories but it applies just the same. No matter how wacky you write your parody or satire, someone believes something that’s wackier than that. Discovering this article scuttled my whole idea, since mine was going to be essentially the same. So not only are these people publishing half-truths and deliberately misleading stuff to try to play on people’s fears (not to mention scientific illiteracy), but now they’re screwing with my blog. I won’t stand for it. I’m going to eat some chocolate right now. That’ll show ’em. This entry was posted in Skepticism on February 18, 2013 by Graeme. I have heard that eating it while upside down prevents 93.5% of chocolate-associated illnesses. Amusing note: Less than two weeks after posting this article, I was diagnosed with diabetes. Obviously, this was caused by the chocolate I had after posting it.